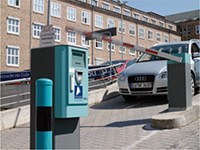 The parking block ComCenter-Parkhaus is situated south of Halle city centre, five minutes' walk from the main railway station – the ideal location for your car. With your parking ticket and the contact-free automated machine, entry and exit to and from the car park is simple. Rent a parking space on the top floor for € 44 per month and on the lower floor for € 55 per month.